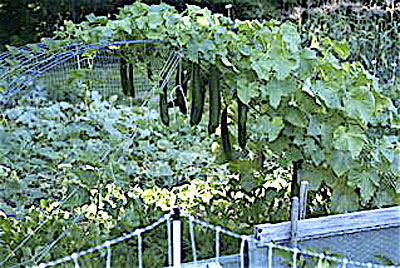 I was searching for a better way to trellis our cucumbers and cantaloupes when I came across this as well as some others that were very tall, similar to a pergola. I was inspired! Using some deck wood we picked up from Craigslist's free section, the Hubby built me these. They're about 4x5 feet and 2 feet tall. I only planted two regular cucumbers and two pickler cucumbers, but next year, I'll definitely start more. I took these pics the day he built it...it's been a week or so since they went up and the cucumbers seem much happier than before and are slowly creeping along the top. Even the cantaloupes which were looking a little downtrodden are perking up. Although, I think I need new seeds, only two out of the eight I planted actually sprouted. I'll keep you posted on how well they work.